Two mini-rovers have sent their first pictures back from the surface of the asteroid Ryugu, a day after they were dropped off by Japan’s Hayabusa 2 spacecraft. The pictures are blurry because they were taken while the rovers were falling and hopping around the half-mile-wide asteroid, more than 180 million miles from Earth. As fuzzy as they are, the photos represent a huge victory for the $260 million Hayabusa 2 mission, which was launched nearly four years ago to get an unprecedented look at the surface of an asteroid. The Japan Aerospace Exploration Agency first tried to put a rover on the surface of an asteroid more than a decade ago, during a mission to a space rock called Itokawa. That part of the mission fizzled, however, when the MINERVA rover carrier missed the mark and sailed off into interplanetary space. Hayabusa 2, in contrast, dropped its MINERVA-II-1 carrier right on target. The carrier deployed two 7-inch-wide, disk-shaped rovers that touched down on Ryugu’s rock-strewn terrain. It took a while to get the pictures back to Earth because they had to be uploaded from the rovers to the mothership — and then relayed back to Earth for processing. The first snapshot, taken during Rover-1A’s descent, shows Hayabusa 2 as a bright smudge in the black sky above and the surface of Ryugu as a bright smear below. Hayabusa’s solar panels, which account for most of the spacecraft’s 18-foot width, can be made out as fuzzy blue rectangles. “Although I was disappointed with the blurred image that first came from the rover, it was good to be able to capture this shot as it was recorded by the rover, as the Hayabusa2 spacecraft is shown,” JAXA’s Tetsuo Yoshimitsu, a team leader for MINERVA-II-1, said today in a statement. An image taken by Rover-1B shows Ryugu’s rocks more clearly. The pictures are reminiscent of the attention-grabbing views sent back from the surface of a comet by a European-built lander during the Rosetta mission. When Makoto Yoshikawa looked at the rover pictures, he saw redemption. Yoshikawa served as project scientist for the original Hayabusa mission to Itokawa, and is now the project mission manager for Hayabusa 2’s rendezvous with Ryugu. 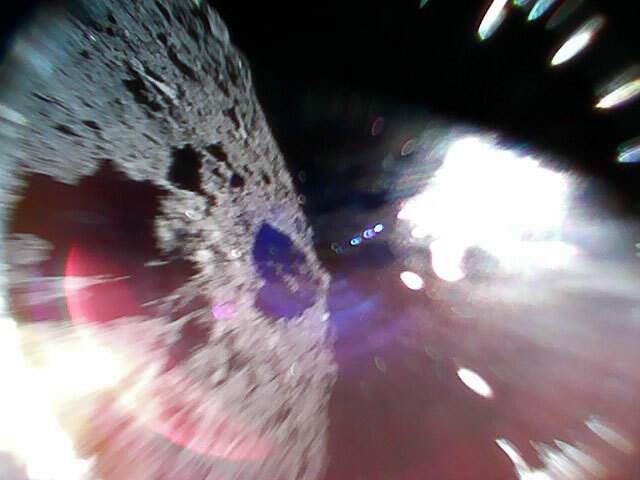 “I was so moved to see these small rovers successfully explore an asteroid surface, because we could not achieve this at the time of Hayabusa, 13 years ago,” he said. The Hayabusa 2 mission team is continuing to acquire data for analysis, and further pictures are likely to be distributed first via the mission’s Twitter account. A larger MASCOT rover, contributed by the German and French space agencies, is due to be dropped toward the surface next month. Next year, Hayabusa 2 will dispatch yet another mini-rover with its MINERVA-II-2 deployable carrier. The main spacecraft will also descend to the asteroid’s surface to collect samples for return to Earth in late 2020.